I am growing Salvia dorisiana as a houseplant for the first time. I am worried about the deep brown spots developing on its leaves and along the leaf edges. I don't see any evidence of insects or downy mildew. I did just recently repot my plant. I used a combination of commercial compost (maybe 25 percent max) plus standard potting soil and a cactus mix that isn't very gravelly. Any ideas about what may cause this problem? This sounds like a condition called fertilizer burn. It could be caused by low moisture, high fertility in the potting media or a combination of both. Fruit-Scented Sage (Salvia dorisiana) does love rich soil, but this one may be getting too much fertilizer. I suggest thoroughly drenching the plant with plain tap water to leach out the excess fertilizer. Do this the next two times you water. Use enough so that the water runs out of the pot's drain holes. Later, don't forget to mist this plant to give it the humidity lacking in your environment. If this doesn't work, please send us a picture to help with a second diagnosis. I wish your plant a strong recovery. 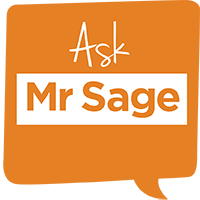 Ask Mr. Sage is based on topics raised in calls and emails we receive at Flowers by the Sea.